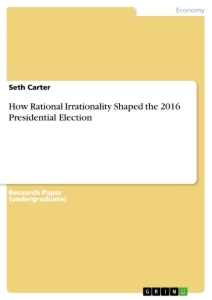 This paper seeks to establish evidence for the existence of systematic irrationality in the democratic voting of the 2016 United States Presidential election. The results of some of the key movements and deviations during the electoral process are scrutinized under the theoretical lens of Brian Caplan’s theory of rational irrationality and found to offer empirical support for the theory. Furthermore, the paper seeks to investigate the possible regulatory policy implications of elected officials chosen on the basis of systematic bias and determine the possible impact of these results. A. The topic of this paper concerns the unusual electoral outcomes of the 2016 United States presidential election and explores a theoretical model for the causes as well as possible effects of the election on regulation. In this endeavor, I propose the public choice theoretical explanation of Brian Caplan’s framework of rational irrationality to answer the question of why electoral outcomes deviated so sharply from the less ideologically radical politics in years directly prior to this electoral process (Caplan, 2007). Empirical support for this framework in analyzing the electoral outcomes is gathered from the Survey of Americans and Economists on the Economy (SAEE) and the electoral outcomes of three swing states across the two most recent presidential elections (NBC News). B. The concept of the systematic failure of democracy analyzed from an economic standpoint is not new. Anthony Downs argued in his 1957 work An Economic Theory of Democracy for a model of rational ignorance writing, “it is irrational to be politically well-informed because the low returns from data simply do not justify their cost in time and other resources.” Gordon Tullock furthered this analysis in various literature throughout the mid-to-late 20th century, arguing that because one vote is extremely unlikely to change the outcome of an election, a rational voter has little incentive to acquire adequate information given the high opportunity cost of time spent acquiring information (Perry, 2008). Empirical evidence to support the rational ignorance literature to some degree abounds in polling. For example, only 62% of American adults could name the current Speaker of the House of Representatives in a poll by Politico, and only 40% of American adults were able to name both of their senators (Caplan, 2008). An analysis such as rational ignorance that includes an information deficit offers a starting point in explaining electoral outcomes, but has been subjected to several major criticisms in the literature. C. Responses to rational ignorance as an explanation for electoral outcomes and the subsequent policies that arise prominently include the Miracle of Aggregation. The reply emphasizes that even if most voters are rationally ignorant, this only implies that ignorant voters can be expected to vote randomly. Thus, even if only a small percentage of the population qualifies as informed voters, that small percentage will ultimately still bear the political clout to choose what they informedly view as the most reasonable candidate. A further critique is that many voters use “cognitive shortcuts” by means of information signaling to determine their choice of candidate, and thus, have no need to be aware of all relevant political information to make an informed decision (Caplan, 2008). D. This paper chooses to utilize Brian Caplan’s theory of rational irrationality precisely because it circumvents these objections and explains democratic failures or seemingly irrational electoral outcomes as not because voters are ignorant or deceived, but precisely because they receive the things that they tend to want. A. The most significant and to many, surprising, consequence of the 2016 presidential election was the victory of Donald Trump, who managed to successfully defy Republican Party establishment figures while espousing rhetoric containing a strong anti- immigration as well as anti-free trade bias. How might this have happened? And what might the policy implications of candidates of these sorts in office be in regards to economic regulations? A. Caplan’s theory of rational irrationality lends itself to the analysis of the 2016 election by explaining voter behavior not as a result of classical rational ignorance, but by empirically arguing for the existence of pervasive and irrational cognitive biases that are bound to affect the direction of voter behavior in the aggregate. In defining rational irrationality, Caplan distinguishes between two types of irrationality: epistemic and instrumental. Caplan’s theory posits that epistemic rationality is a belief-forming process by which careful reasoning is used to develop reliably true beliefs. Instrumental rationality. rather, is described as the process of seeking one’s actual values and ends given a prepossessed set of beliefs. Rational irrationality, thus, describes a situation in which it is instrumentally rational to be epistemically irrational. This model would then be applied to voting by accepting two key assumptions: that for certain activities, the marginal cost of holding an irrational belief is low, and thus, by the law of demand, individuals will consume more irrational beliefs than they might have otherwise, and secondly, that people have preferences for certain beliefs over others. These may be thought to include beliefs that are satisfying or comforting. In the case of voting, unlike markets, the marginal cost of error is relatively low, as one vote has a negligible potential to change an election. In the context of the model, this implies that consumers will consume more irrationality when they vote and thus, systematically select policies and candidates that appeal to their rationally irrational bias. This change in the median platform with systematic bias is modeled by figure 5 (Caplan, 2008). B. The effects of policies instituted by politicians elected by means of rational irrationality extend somewhat beyond the scope of Caplan’s theory. Despite this, the effects of potential policies brought about by rational irrationality may still be analyzed under the theoretical frameworks of Ricardian Equivalence, and the arguments of economists such as Don Boudreaux and George Borjas. A. The empirical support for Caplan’s theory and evidence from the 2016 election results in key swing states are intended to demonstrate the existence of systematic anti-trade and anti-immigration biases and their importance in determining the outcome of the 2016 election. In particular, election results are compared between the 2012 and 2016 elections in swing states and the economic character of the regions differing in voting are considered from a historical perspective (NBC News). The economic data intended to support the existence of irrational bias is derived from the SAEE, which utilizes econometric methodology to estimate the opinions of professional economists and the general public. The basis for declaring certain beliefs irrational is the development of the economic construct of the “enlightened public”. In the examples cited from the SAEE, econometric controls for gender, race, and income are implemented and the pure effect of increased education on the beliefs of the general public is measured as the effect of the education regressor. When the educated public and economists agree on economic issues, but the same general public without the econometrically added general education disagrees, their beliefs are considered definitively irrational (Caplan, 2008). 1. Figure 8 (deleted by editor) illustrates the econometric result of the questions, “Do you think trade agreements between the United States and other countries have helped create more jobs in the U.S., or have they cost the U.S. jobs, or they haven’t made much difference,” and Figure 10 illustrates the result of the degree to which participants agree that, “Companies sending jobs overseas,” is a reason that the economy is not growing more quickly. The SAEE shows that economists and the enlightened public roughly agree that trade agreements either haven’t made much difference or have actually helped to create jobs. The unenlightened public, however, views the effect as somewhere between costing jobs and having made little difference. Likewise, in Figure 10, economists and the enlightened public generally agree that “companies sending jobs overseas” is somewhere between not a reason at all or a minor reason that the economy is not growing more quickly. The unenlightened public, again, disagrees and leans strongly towards companies sending jobs overseas being a major reason that the economy is not growing more quickly. Due to the vast difference between the public and enlightened public’s responses and lack of randomness in the response of the public, we may conclude that the public’s leaning towards trade agreements costing jobs is an example of rational irrationality due to a collective cognitive bias, particularly, an anti-trade bias (Caplan, 2008).